Drive your growth up and costs down by economically transforming your IT systems to meet dynamic changing markets. Aprico Consultants is your agent for digital change. transformation to meet your business needs. Is microservice architecture about to kill the ESB? 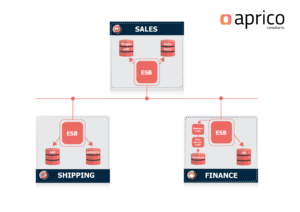 Quite some time ago, software vendors promoted a centralized hub-and-spoke middleware product for Enterprise Application Integration: the EAI broker (A). Then SOA came along, and the tool of choice became the ESB. But in many cases the ‘B’ was for ‘Broker’ instead of ‘Bus’, as most vendors just face-lifted their EAI products. It took another while to see a new kind of decentralized version of the ESB (B), but the damage was done. These days, vendors avoid the ESB label. In the current market, everything has to be distributed and flexible, while the ESB is seen as a heavy, monolithic and inflexible backbone. These last years, the offering moved towards a completely distributed approach, where applications are seen as a collection of fine-grained, autonomous services, communicating through lightweight protocols and offering more flexibility and scalability: microservices (C). The flexibility of microservices comes with an even bigger challenge regarding service-to-service communication. As the number of microservices grows, the death star anti-pattern lurks around. Service meshes were developed to address a subset of the inter-service communication problems in a totally distributed manner. But wait, how do we expose all those microservices’ public interfaces to the outside world? Through an API gateway. Centralized! And how can we address the API consumers’ variety? Through BFF: Back-end For Front-end. 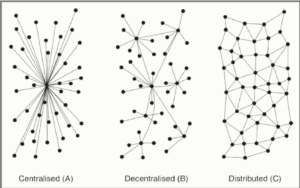 Decentralized! Taking that perspective, it seems that not everything is meant to be distributed. SOA and MSA: a clash? Due to the explosion in mobile device adoption, the rise of Internet business models, and SOAgility, companies have the opportunity to develop new customer and partner channels – and embrace the potential revenue growth that comes with them – through the API economy. Customer-facing and partner-facing engagement systems are the first to be impacted by the need for a dynamic integration style – and therefore the first where it makes sense to start working on. At the same time, organisations that have invested significantly in EAI or ESB technologies are unlikely to replace those technologies with microservices in the blink of an eye. These tools will continue to play a critical role in enabling organisations to integrate their (legacy) systems (such as ERP and mainframe) and applications effectively for quite some time to come. These technologies are still well suited to manage the integration of a few closely-aligned teams working with a predictable technology stack. In this sense, they are effective application integration platforms rather than something that can work across a wide and diverse enterprise. As a conclusion, if the one-style-fits-all architecture is not yet conceivable, both architecture types will inevitably exist together. But then again, the microservice architecture approach offers a good opportunity to try out new business models and at the same time assess the existing ones. The new landscape encourages reflection. Which parts of the environment do you still want to or have to operate centrally? Mission-critical core services are changing rather infrequently, indeed. But still, why wouldn’t you want to improve their actual set-up? And of course, your IT environment has more than mission-critical core services alone. Where does it make sense to disrupt the existing models, put a fail-fast strategy in place and create so-called edge services? Questions? Don’t hesitate to get in touch. Aprico develops and implements innovative ICT solutions that improve productivity, efficiency, and profitability, applying cutting-edge expertise and perfectly mastering both the technological and business aspects of clients in all industries. Aprico enables clients to be more efficient and to take up technological challenges, including SOA and MSA. After the cloud and big data, artificial intelligence appears to be the next concept in vogue. Some figures clearly illustrate the magnitude of the phenomenon. According to a study by Vanson Bourne in July 2017, 80% of companies are already using some form of artificial intelligence (machine learning or deep learning, see below), while 30% of companies plan to increase their investment in AI in the next 3 years. In addition, 62% of companies plan to appoint an AI Director in the future. Overall, according to the survey, companies are thinking about the deployment of AI in data transmission, intelligent workflows and decision support processes, as well as in large-scale analytics. The only barriers to a wider implementation of AI in the business, are a lack of IT infrastructure and a shortage of skilled IT staff. First of all, we must agree on the definitions we use. According to Cigref (the French network of large companies), AI is “the capacity of a functional unit to perform functions generally associated with human intelligence, such as reasoning and learning.” In practice, AI covers two main areas: machine learning and deep learning. According to Cigref, machine learning “combines algorithms that learn from examples and from data.” In other words, machine learning makes predictions based on data sets. Deep learning is all about a technology’s ability to learn from raw data. AI also includes other technologies, such as symbolic AI, logic programming, and rules engines. Since all of this has to do with learning processes, it is necessary to feed the systems first, before training them in the context of multiple iterations, which requires the use of data scientists. As a first step, AI targets business areas such as marketing, maintenance, logistics, control, human resources, and customer relations. In other words: all sectors where data volumes are (very) important and where models, trends, and repetitive operations can be identified through analytics and information processing. The evolution consists of moving from (human or automated) programming to learning, with systems that gradually become self-learning. Please note that a human no longer needs to understand a phenomenon or process to teach it to a machine, as it swill seek and find the right solutions. At the moment, it’s still a dream to think that machines will become really intelligent – according to some sources even more intelligent than man. However, computing power – especially neural computing – can significantly improve the speed and volume of data processing, provided you have quality data, accurate algorithms, and specialized human knowledge. Because in the end, the quality and nature of the data largely determine the technological choices. Overall, the company will have to choose between either contacting an external partner who will develop a custom algorithm, or investing in existing AI solutions that the company will buy or rent as SaaS (Software as a Service). Similarly, APIs (Application Programming Interfaces) can be developed to access and use data in AI applications automatically and transparently. That said, you don’t need to be called Amazon, Uber, Netflix or Airbnb to embark on an AI track. Data processing and data analysis are not the exclusive domains of data scientists from large organizations. Data storage infrastructure and analysis tools are available for everybody in the cloud. At the same time, harnessing the potential of AI requires not just a strategy, but also budget and time. Thanks to AI, small and medium-sized companies will be able to perform complex tasks more efficiently and at a lower cost. It will allow them to develop new business models, but also to consider new activities – completely new or derived from existing products. At the end of the day, AI leaves no room for improvisation. AI requires not only technological knowledge, but most and foremost a perfect understanding of the customer’s business. Who else but your trusted IT partner understands your strategy, needs, and goals? Aprico Consultants assists, guides, facilitates, and coordinates your projects to enable faster implementation, generate efficiency and reduce costs. Will chatbots replace your mobile apps tomorrow? Chatbot: new out of old? Conceived in the fifties by British mathematician Alan Turing, whose work was picked up in the sixties by the famous MIT, a bot is a piece of software capable of automatically performing a specific task. In essence, a bot is a kind of script that allows, for example, to add an event to a calendar or make a reservation. The emergence of neural networks and artificial intelligence made it possible to design much more sophisticated algorithms and a more ‘natural’ interaction with users. They allow bots to have a better understanding of human language. As a result, bots have been associated with messaging systems, hence the term ‘chatbot’ or conversational agent. Facebook Messenger, for example, offers different specialized bots in an online store (weather, traffic information, news, and more). Other players, such as Microsoft (Skype), Google (Now), WhatsApp, Kik, Slack or Telegram also offer this type of chatbots. Assuming that chatbots are able to perform specific tasks and that their success is growing, one could easily imagine them replacing mobile apps, based on the integration of commands into a messenger application. Especially since the development of a chatbot is significantly less expensive than that of a website. In addition, a chatbot is available 24 hours a day, user-friendly and much cheaper than a human operator. At first, chatbots were mainly used in the field of customer relations. Gartner estimates that by 2020 no less than 85% of customer relations will be handled by chatbots, replacing human intervention. It comes as no surprise that a company like Salesforce, world leader in customer relationship management (CRM), decided to invest heavily in a bot platform. Other obvious markets for chatbots include marketing and retail. Companies like Sephora, Bank of America, Pizza Hut or closer to home Bol.com, are already using marketing chatbots to interact with customers. On the other hand, according to a survey by IT infrastructure provider Dimension Data, only 4,2% of Belgian companies have already deployed a bot for their client communications. However, 29% plan to do so in the next two years. In addition, the technical support departments of companies can use chatbots to provide answers to users who work on software, especially in the field of office software. For its technical staff, Engie has created a bot that is integrated with Skype and helps the company control its wind farms. Field technicians query the system for technical characteristics of the wind turbines and then check the items on site. In Brussels, STIB has joined forces with mortierbrigade to develop a chat messenger for Facebook Messenger. The goal is to raise awareness of the different neighbourhoods of the capital. As a result, the Cath & Gery bot helps users to learn more about the Sainte-Catherine and Saint-Géry area. A chatbot can also be deployed to automatically process a transaction, such as the purchase of a ticket (plane, train, concert), a sales transaction (in particular on an e-commerce site or a site for internet banking) or a request for information (for example about the weather or the stock market). The interest in chatbots is growing quickly. IDC estimates that by 2019, 75% of employees whose daily tasks involve the use of business applications will have access to intelligent personal assistants to increase their business skills and expertise. According to Juniper, chatbots could represent up to 8 billion dollars in savings. To make a chatbot project succeed, French communication agency Tomg-Conseils describes six steps that must be respected: realize a real benefit for the user; master the scenarios and provide a fluid user experience; predict the unexpected and add a layer of natural language; provide a friendly chatbot offering a playful experience; choose the right technical solution and have it tested – and retested – by real users.But isn’t that advice that applies to any computer project? Aprico Consultants is a consulting firm specializing in IT projects in architecture and information systems transformation. By firmly accelerating digital transformation processes, the company provides its customers with the flexibility, performance and competitiveness they need to strengthen their position in the market. Aprico Consultants closely collaborates with clients to translate their strategy, objectives and constraints into pragmatic transformation programs that deliver real added value and a proven return on investment. The right technology platform unites and optimizes every segment of the value chain, transforming current processes and uncovering and energizing new and more efficient ways of doing business – keeping customers and personnel happy. Business process management (BPM) is a core task of intelligent organizational design that contributes to operational excellence. We design and develop intelligent, tailor-made and customizable, scalable business process to support business activities. The obtained processes can then be further automated such that workflows became applications that maximise the collaboration between organization’s roles and that facilitate the way data are handled. We implement lightning-fast, fault-tolerant and unified tools to collect, integrate, cleanse, profile, synchronize, visualize and share data. The result is dramatically improved data accuracy and availability which gives you the power to take advantage of more applications and data resources than ever before as you respond to business needs with speed at limited cost. Aprico Consultants focuses on the role of IT governance in the strategic alliance between your business objectives and resource utilization. The right governance is critical for optimizing and accelerating performance, improvements and success. We are able to strengthen your governance and risk mitigation with proven IT initiatives and solutions that control operational risks, align closely with adaptive business strategy and effectively change your organization’s efficiency, customer focus and innovation drive. New trends and technologies place legacy architecture and business agility under real strain. We help you rethink your approach, reduce overall complexity and transform your organization, ensuring you stay current with emerging technologies and can take full and fast advantage of new opportunities. We help put the right IT infrastructure in place to support your business goals, manage complex change and realize the value of your technology investments. We ensure that your investments are cost-effective with rapid return on investment..
Aprico Consultants works with you to define your strategic positioning in a disruptive market and drive your strategy forward by leveraging current and new technologies, and aligning IT with business realities across all fronts. Our consulting methodology is an intelligent guide to anticipating change and converting digital threats into opportunities – smart strategic transformation woven seamlessly into enterprise architecture and operational needs for now and the future.